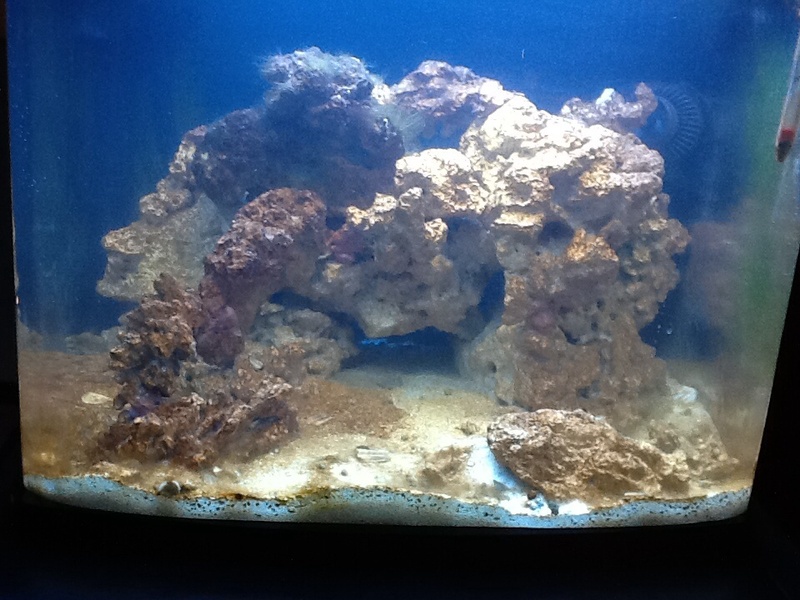 I've just started my first ever saltwater aquarium! . It is a biocube 29 that I got for Christmas. It was set up on the 9th of February. I'm doing this to track my progress so I can see my tank mature into (hopefully) a lovely reef. inTank media and fuge baskets. candy cane pistol shrimp "Garth"
I started with 20 pounds of caribsea arag alive fiji pink sand which sadly dried out in shipping because the bag leaked. They gave it to me for free though so that's nice. I ordered 5 pounds of tukani and takota live rock, 6 pounds of south sea base rock (I think) and 18 pounds of dry Marco key largo rock. I was very happy with the rock. I put it together using DD aquascape epoxy coraline color. I'm very happy with the scape. Does 10 hours sound like a good length of time for the lights to be on? Nice start and welcome to the biocube club. Mine was my first reef tank and I love it. I do wish it were bigger but that just solidifies my passion and commitment to this hobby for the long haul. 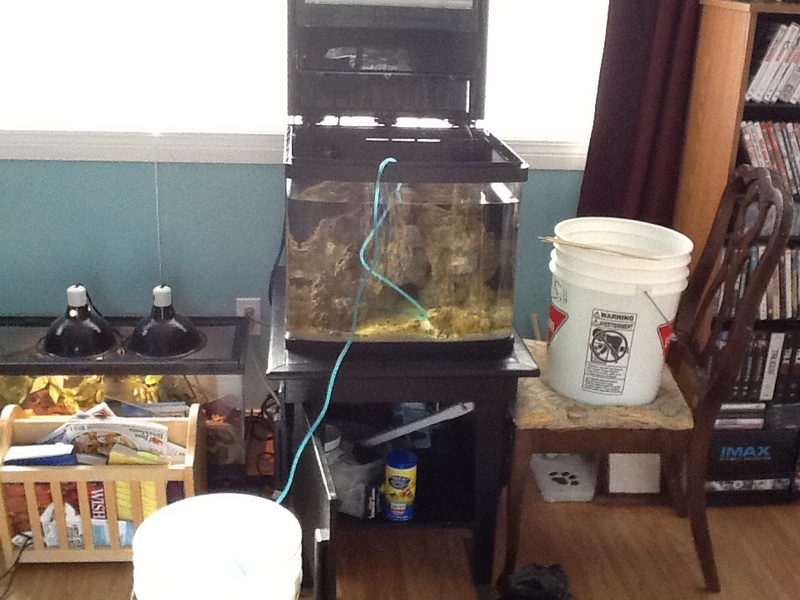 10 hours is fine, you kind of can guage your light requirements by you algae and coral. They will tell you if you need more or less. If you have too much algae (before corals) dial it back a little. 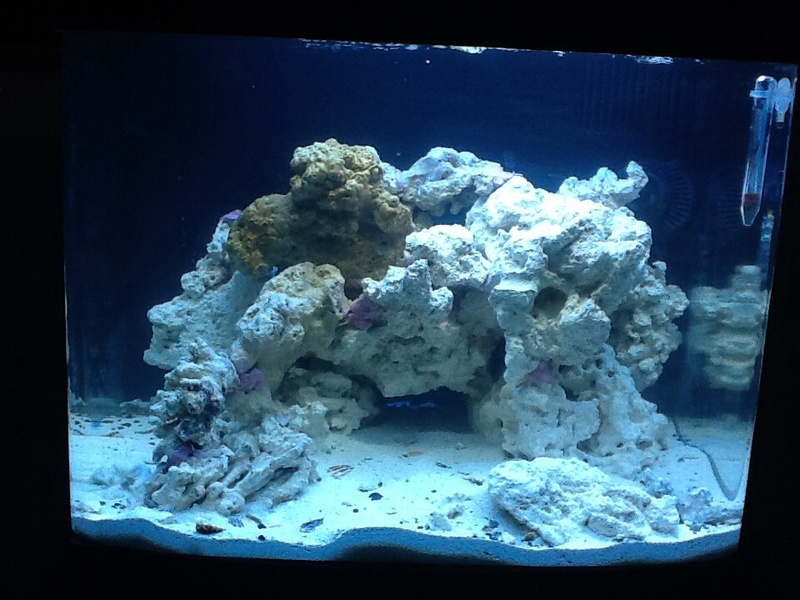 Once you have corals, start with less light and inch it up to about 10-12 hours. 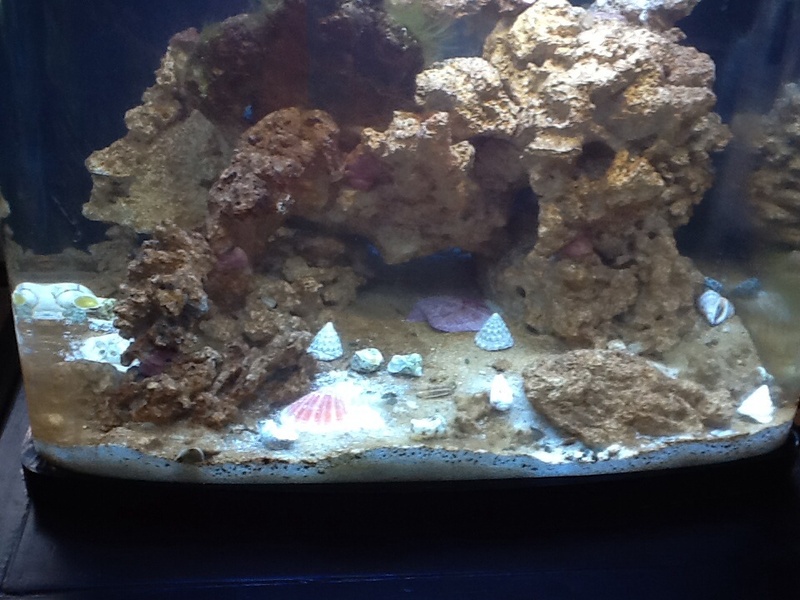 If you see bleaching or receding in corals pull back. If your corals are reachig for the light increase it. I do recommend upgrading the stock lighting. 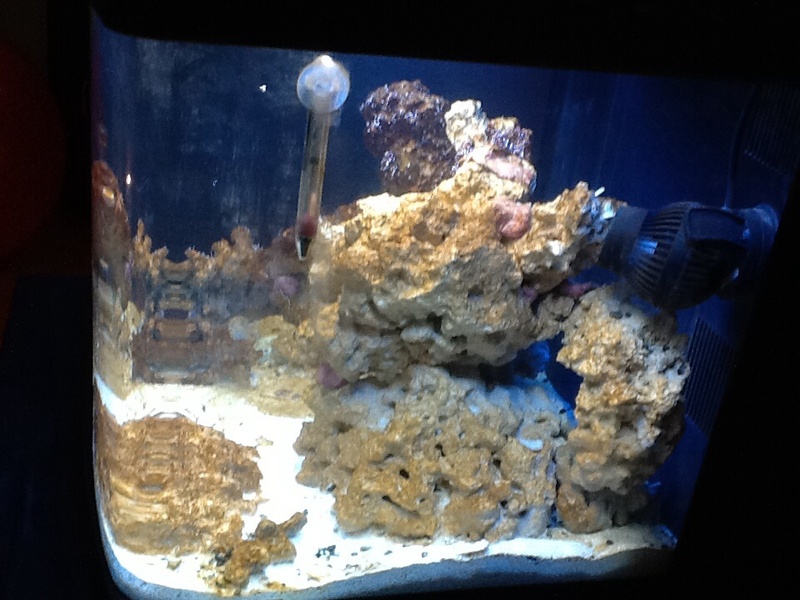 Will help with temp control as well as allowing you to keep any coral or clam you want. Thanks longdoggy. I've been keeping the light on for 12 hours or so and wasn't sure if that was too long. If there anything I can do to keep the heat down? Last time I checked it was running at 81. Is that too high? Yea less light. I found the stock PC bulbs to be the biggest contributor to my heat issues too. That, and I found if the pump gets dirty or junked up is becomes a heater. At best, I had my biocube running around 81-82. At its worst, with dirty pumps and stock lighting in the summer I was at 85. Had a lot of die off and bleaching. It pretty much crashed. Note, I do keep my house at 70-72 yearly and tank is not near a window or vent. LED my temps run 76.5-78 with no heater and actually one additional power head on top of my scenario above. Will leaving the maintenance door open help keep it from happening? I only noticed a minimal difference when doing so. Probably <1 degree. I also did not like the look of an open lid (guess this is personal preference). Last, you will notice additional evaporation by doing so. What some do (easier with your BC 29) is mod in an extra PC fan to lower temp a little. Maybe ~1 degree. Again, this will increase evaporation so an ATO may be needed to maintain stability. Looks good so far! I have the same tank, started mine on 27 Dec. I also am sticking with stock lights so far. Now I know it's winter, I keep my house at 70, and so far, I've been able to have a very stable temp in the tank at 76 to 78, with lights on for about 10.5 hours. We shall see how the summer months affect this. Thanks longdoggy and Idaho ken. My house is kept high 60's, maybe mid 70's in the summer. Would replacing the fans altogether with better ones solve the problem? The current ones are so noisy I wanted to replace them anyway with something quieter. I can't say from experience, but if guess minimally. Thanks tinpanva. Hoping to get my clean up crew next thursday as petland has already ordered this week. 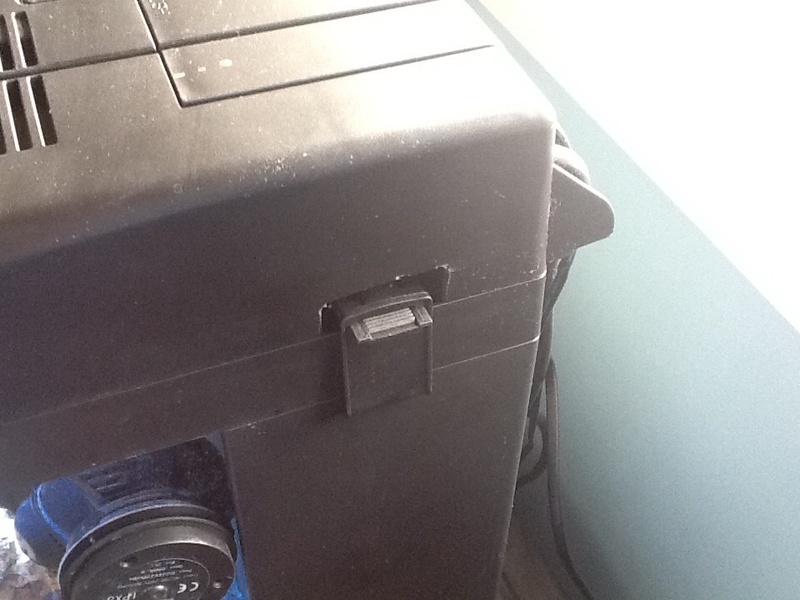 I'm, looking at the fan exhaust system right now, and am wondering if they are opened up a little more, less obstructing plastic, if it would help? I may have to goof around with this. I do know if you go with a bigger fan(s) I can assume it will generate more noise, especially with the limited hood exhaust area. Updated FTS and a photo of the evil hair algae rock. I swear it doubled over night. Sorry for crappy ipad pics. Also, my sand has these all along the glass. It seems that they've been showing up one by one. Should I be worried? 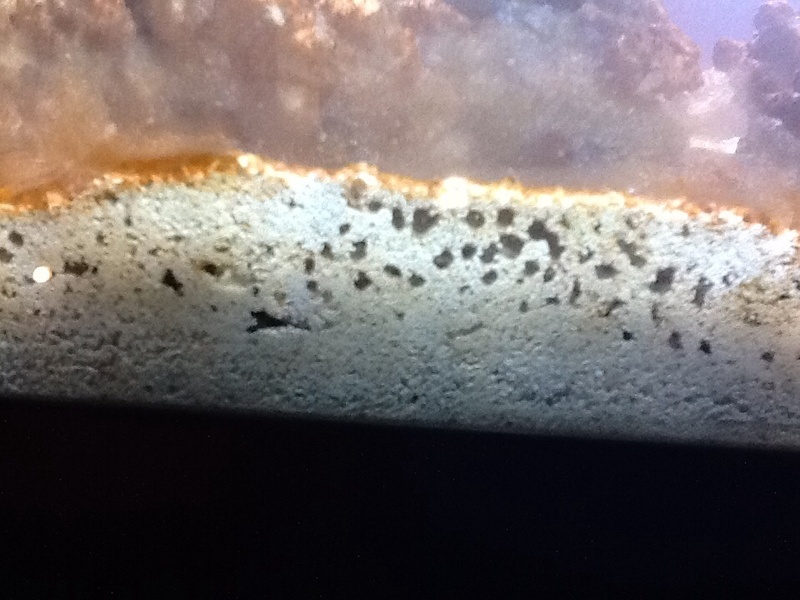 They seem to be little gas bubbles or something. 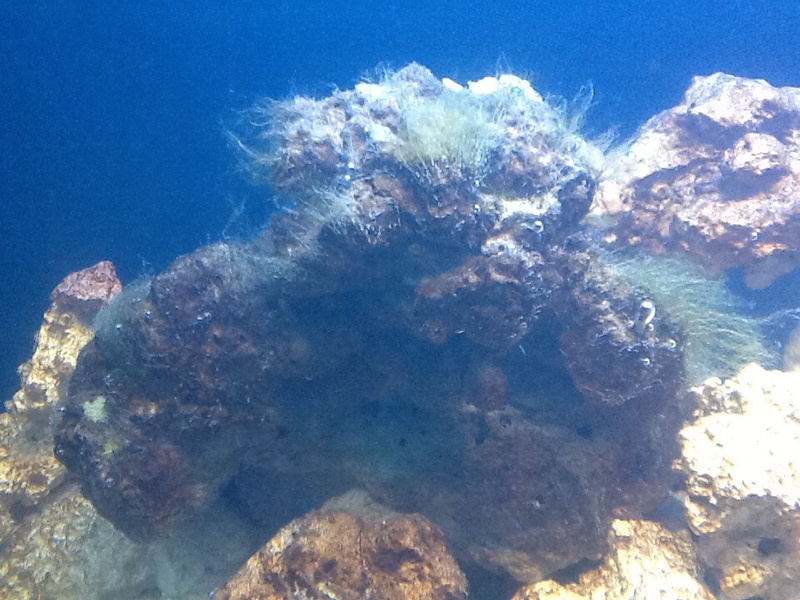 Gas bubbles and hair algae are both totally normal and part of the cycle process. Your building your waste consumption machine. Gas bubbles are I believe nitrogen gas bubbles. The hair algae is growing to consume your waste as well. In time with maintainable and water changes these will subside. 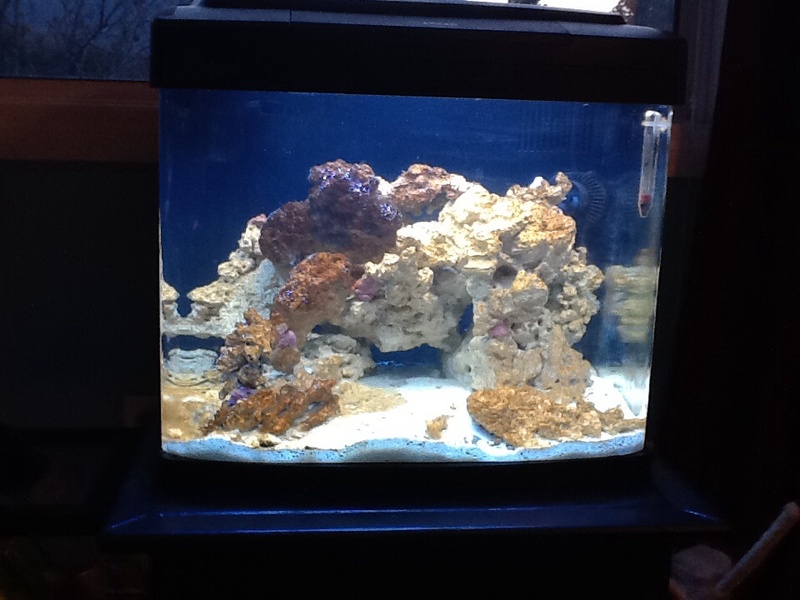 After this wave is done your tank will be plenty ready for corals. 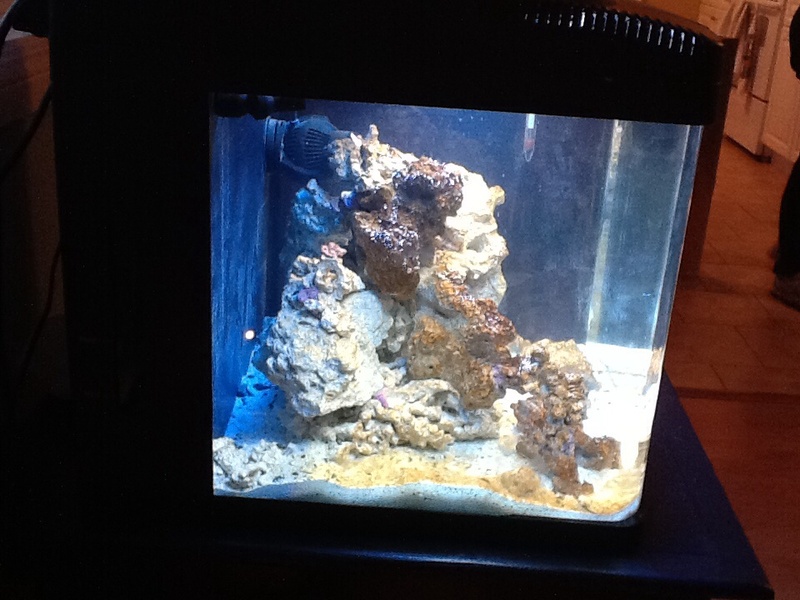 I remember my tank going through this from month 1-6 and lost a few corals to hair algae overgrowth. Thanks long doggy, do you think the hair algae and diatoms will be too much for my CUC when I get it? I just bought a biocube 29 and I am about to get it up and cycling. I'm torn between the tunze 9002 and the aqualife 115. 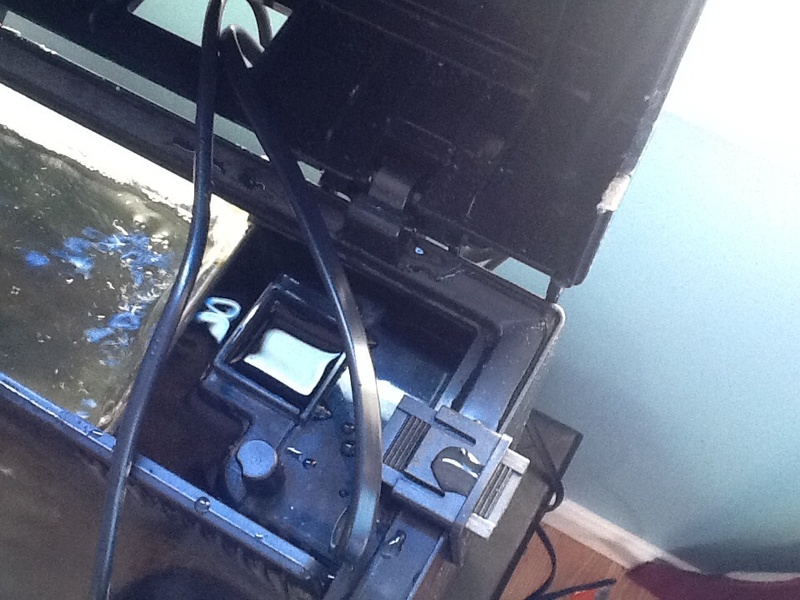 Do you have your skimmer in and running? If so how do you like it ? My skimmer isn't running yet. I was just working on cutting a hole to hang it today. I got the aquaticlife 115. Would an aquastyleonline.com led kit be good? Finished the hole for my skimmer to hang. It's not running yet. I did test it out once though and there were so many bubbles that the collection cup filled in minutes. Is that normal? 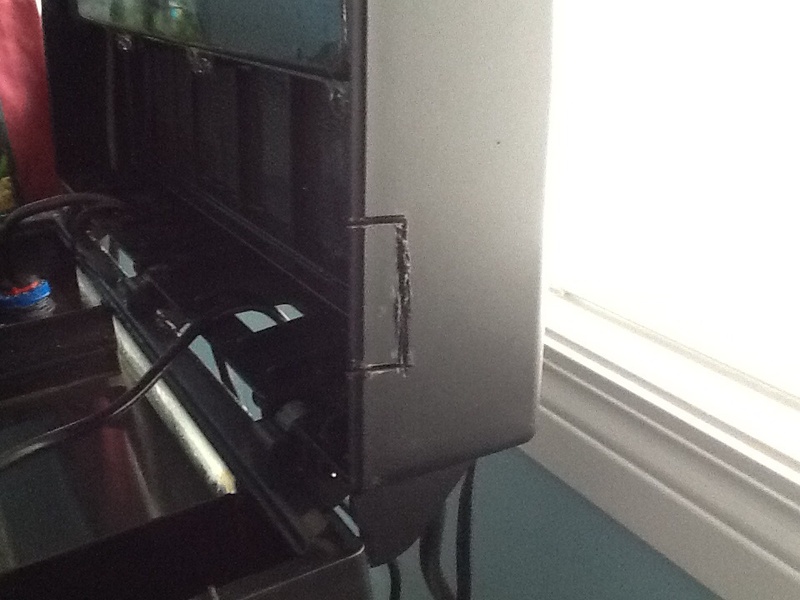 The dremel didn't work too well, so it was finished off with a hacksaw, power drill and file. You probably have it turned up too high. You want the bubbles to almost reach the top but not quite this way they will get a good foam on top that will overflow into the collection cup. Thanks cronicreefer. I really have no clue how to use it. Its the aquaticlife 115. I'm not sure which way to turn it. I tried both ways in the test, but it just kept bubbling on.